“Right now, I would pay $100,000 for 10 percent of the future earnings of any of you…Many of you are a million dollar asset right now.” – Warren Buffett to a group of MBA students. Well, there you have it: the gist of a debate over the value of higher education. Some say high; some say low. The media have been loaded in recent months with angst about student loan debt. By any absolute standard, this is a big exposure. The default rate on student loans has spiked to 13.4% for graduates of the class of 2009. Mounting student debt triggers a great deal of finger-pointing: it is claimed that universities charge too much; employers aren’t making jobs available for graduates; the government isn’t doing anything to help; the students didn’t know what they were getting into; and bankers are heartless in throwing hapless borrowers into bankruptcy. Finance 101 teaches that the simple availability of credit should be irrelevant to anyone’s decision about borrowing. Instead, the dominant consideration should be the attractiveness of the purpose to which the borrowed funds will be put, compared to some benchmark. “Attractiveness” can be defined in a host of ways—the economic test of attractiveness would be whether the return on an investment in higher education exceeds the cost of funds to finance it. It could be that all those student borrowers acted sensibly to invest in their own human capital. Thus, the dominant question should be, does higher education pay? Does it yield a sufficient rate of return to service debt and leave something over to lift the student’s standard of living? 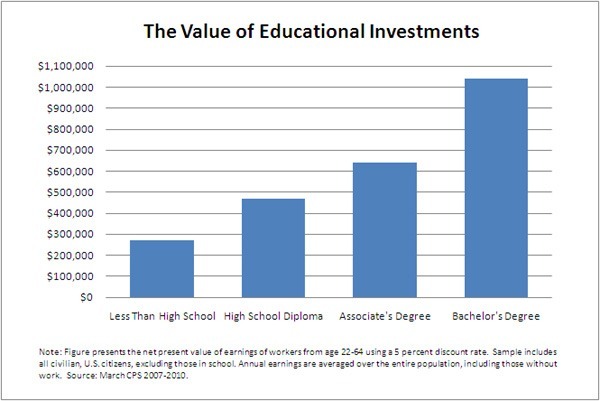 Plenty of evidence suggests that the payoff from investing in higher education is large. The longer answer is “yes, if…” the student borrower is a careful and critical consumer of loans and educational services. To understand the general conclusion and some nuances, let’s look at research findings. Higher education is a much better investment than almost any other alternative, even for the “Class of the Great Recession” (young adults ages 23-24). In today’s tough labor market, a college degree dramatically boosts the odds of finding a job and making more money. On average, the benefits of a four-year college degree are equivalent to an investment that returns 15.2 percent per year. This is more than double the average return to stock market investments since 1950, and more than five times the returns to corporate bonds, gold, long-term government bonds, or home ownership. From any investment perspective, college is a great deal. Another way to view the total dollar benefit of a four-year college degree is to compare the cumulative lifetime earnings of workers based on their educational attainment—as shown in the graph below. Through this lens, a bachelor’s degree clearly provides the largest boost to earnings. Over a lifetime, the average college graduate earns roughly $570,000 more than the average person with a high school diploma only—a tremendous return to the average upfront investment of $102,000 investment. An associate’s degree is worth approximately $170,000 more than a high school diploma. · Higher quality-of-life. Research shows a positive association between higher levels of education and health, civic engagement, family stability, and a negative association with ills such as crime and addiction. · Reduction in risk of unemployment. This may be the most obvious un-quantified benefit from an investment in higher education. The Brookings report acknowledges that its own ROI estimates are not adjusted for the risk of unemployment. Education provides a valuable hidden option that helps to act as a shock absorber, like an insurance policy, against the episodic employment shocks that business cycles impose. The higher-educated are out of work less often. Today, the unemployment rate for college graduates is 4.1%, about half the rate for the whole U.S. population. This finding is robust across time—see the following graph. I have not seen a value placed on this insurance effect. But given that the insurance is long-lived and apparently so reliable, its value is probably high. · The average ROI may not be a good predictor of likely outcomes. The discussion so far has focused on large-sample findings and generalizations from experience. Maybe the ROI estimates are averages drawn from a wide and skewed distribution: perhaps a few graduates of elite schools get really high salaries and these graduates pull the averages up, while most other graduates don’t fare so well and never realize the average ROI. The average starting salary of MBA graduates is roughly associated with the ranking position of the school. The AACSB says that there are some 13,000 institutions in the world that award higher degrees in business—do all of these produce golden apples? · Personal choices. For instance, the choice of undergraduate major is associated with an enormous range of starting salaries right out of college. PayScale offers some data on this: from low to high is more than a 3X variation. Average starting pay for theology majors is $32,500; for petroleum engineers, it is $98,000. Other choices affect future earning power: where to live; which industry to work in; and which field you chose for training. Higher education opens doors; it doesn’t make you choose which door or dictate the speed with which you walk through. · Other stuff drives success too. In addition to level of education, think of all the other influences on one’s career success: work ethic, integrity, “people skills,” mentoring, and social upbringing. Luck plays a huge role: for instance, the business cycle annually creates thousands of stories of “being in the right (wrong) place at the right (wrong) time.” One’s initial job right out of college has a strong association with future earnings. The PayScale data show that starting salary explains 78% of the variation in salary at mid-career in the same industry. Given this list of factors, it seems inevitable that the ROI from an investment in education is bound to differ from the average result. Higher education is associated with certain good outcomes; but no law says they will occur. Higher education pays, conditional on the critical thoughts mentioned earlier. The higher you go up the educational ladder, the more it pays. Even getting just some higher education pays: an associate’s degree or even a year of college can lead to higher earnings and less exposure to the risk of unemployment. If Warren Buffett—the so-called “world’s greatest investor”—sees a fair trade of education expense for a claim on future income, the return on higher education must be real. Lumni, co-founded by Darden graduate, Miguel Palacios, extends educational financing in return for a participation in future earnings. · Higher education may not be for everybody. You have to be ready to make a sacrifice for your degree: it takes time, money, and great effort. And it takes the academic preparation and intelligence to do the work—Charles Murray has made much of this in arguing that too many people are going to college. If you have doubts about your readiness for higher education, a candid chat with an educational counselor should clear the air. My recommendation: if you have the preparation and the gumption to study, get as much higher education as you can. · Consider the alternatives. There’s vocational training to learn a craft. The military can teach you a great deal about self-discipline and devotion to the team; but if you want to become an officer, you’ll need a college degree. Or you could start a business—venture capitalist, Peter Thiel, has been paying high school graduates not to go to college, but to become entrepreneurs instead. But with 19.7 million students enrolled in colleges and universities in the U.S., keeping up with your peers will have a strong appeal. · Be a wary consumer. Think critically about what you are investing in and the benefit you can hope to receive. These days, students give great attention to their vocational preparation. Learning to reason and communicate well and building your social and moral awareness are hugely important to success in just about any field. So don’t ignore the liberal arts. Instead, focus on the quality of the learning experience you will have. Is the school accredited? Is the school selective? You will learn a great deal from the students around you, so consider what they have to teach you. · Have faith. Focus on getting an education, not just a job. It is absolutely wrong to think of one’s education as a short-term financial transaction. What you put in is clear; what you get out is less clear but likely to prove a powerful advantage over time. Paradoxically, those students most focused on the immediate gives and gets are most likely to make poor decisions about what and where to study. The high rate of student loan defaults in the U.S. is a tragedy, a sad corrective to poor decisions by students and aggressive recruiting by diploma mills. Research is shedding light on predatory sales practices at diploma mills that prey on the unsophisticated aspirants in higher education. Those practices are wrong. Sunlight is the best disinfectant. No doubt, lawsuits and government investigations will prompt more regulation. Meanwhile the best protection is very diligent research, assessment of alternatives, and critical thinking about what you give and get. But the current angst over the currently high student loan default rate should not obscure the well-documented fact that, on average and over time, achieving an education can yield massive benefits to the individual. For most people, borrowing to get a degree will be worth it. Why do we need academic degrees?